Big Ben has a range of juggling, unicycling, magic, mime or balloon shows to entertain all ages. The Big Ben Show - juggling, unicycling, magic and the giant balloon! Ben Ben the clown rides again. He’s a clown! He’s an alien! He’s Fun! And his trousers fall off. 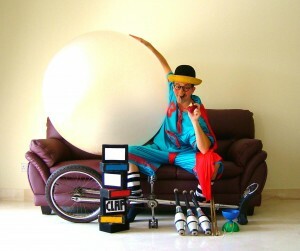 He’s also got loads of juggling and unicycling in his show. Children love him. And he loves children – especially with a little mustard… only joking! 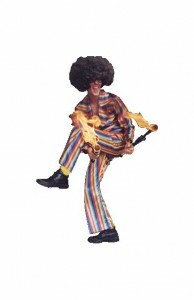 This show is available in a variety of costumes! An incredible finale with juggling on the big unicycle! Big Ben can also include his amazing, reputation making, Giant Balloon Act!! He climbs inside a giant balloon! Captain London - the funniest superhero in the world! Captain London – the funniest superhero in the world! Anyone who wears his underwear on the outside has to be a little bit eccentric! In his over size costume Big Ben is 250 kgs of laughter! Hailing from London, he brings European style street theatre and magic, unicycling and juggling to the world stage! Synopsis: Comedic costume change, the Chinese yo-yo, flying on the tall unicycle with fire juggling, disappearing hanky magic, balancing huge weights on head, and a miraculous audience participation item where people throw giant beach balls at Ben! And the INCREDIBLE FINALE, where ben CLIMBS INSIDE A GIANT BALLOON! Formless Formby - the Rock Circus Superstar! Formless Formby!! Legendary International Superstar! Mr. Formless Formby, international superstar, is back with his groundbreaking style of circus and music! He has captivated audiences all over the world, from festivals like WOMAD to Carnivals such the AIA and LAN KWAI FONG. Experience the legend! Mr. Formless Formby is Elvis, Jimi Hendrix and the entire Cirque Du Soleil rolled into one! Synopsis: devil stick, flaming microphone spinning, chinese yo yo, didjeridu, hilarious audience participation as volunteers are turned into a rock band complete with wigs and musical instruments, and a grande finale where everyone gets a chance to throw giant inflatable bananas at me. For an encore, Formby does the giant balloon! The Big Ben Bubble Show - Amazing fun with Amazing Bubbles! The Big Ben Bubble Show- Amazing fun with Amazing Bubbles! Big Bubbles, Huge Bubbles and Absolutely Enormous Bubbles! This show is fun for all ages. 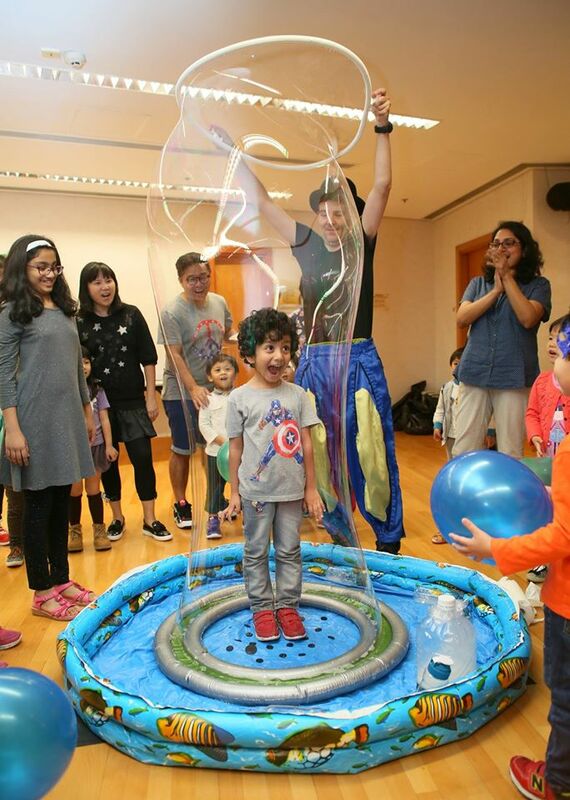 Big Ben makes bubble sculptures, spinning bubbles, bubbles inside of bubbles. 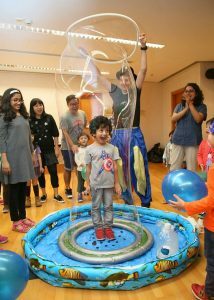 Children come on stage and help make bubbles! At the end, children even go inside bubbles! This has to be seen to be believed! 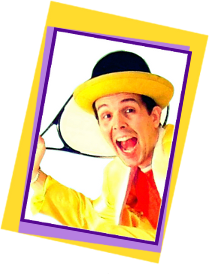 Big Ben also performs magic, mime or balloon shows, as well as two person shows. 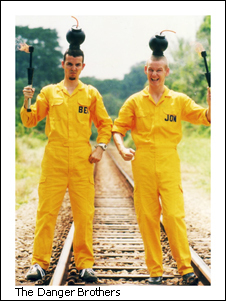 2 guys with only 1 brain cell, all the way from the UK, with a show that can only be described as dangerous! Circus and seriously stupid stunts! Howl with laughter at their dumb pranks! Big Ben is an expert at entertaining off stage. Watch him wander through the crowd, dazzling with his impromptu performances! Stilt walking, close up magic, balloon sculpting, unicycling, juggling, puppets, and of course clowning! Juggling is a fun activity for all the family. Learn to juggle with one of the fore most instructors in South East Asia. Ben Matthews was the president of the Oxford University Juggling Club, and a founder of both the Singapore Juggling Club and the Singapore Unicycle club. He worked as a circus instructor for Cirque Du Soleil’s outreach programme. He has been teaching juggling since 1987. He was also an English teacher for 4 years.